My homemade workbench top (my first big project) gave up a few weeks ago. I saw an advertizement for this and had a coupon for 20% off so net price for the work bench came out to $129 …. not a bad price. - Either I am bad at assembly or the mounting hardware is slightly off … i had trouble keeping assembly square. Overall, I think that solid and stable are the two most important characteristics of a workbench. And this unit is both of those things. The out of square underside assembly did not translate to an out of square surface or wobbly legs. From a convenience of use perspective, I am going to add some after market holes and look at expanding to 3/4” size. No room for a front mounted vise. I will probably try to fiddle with the assembly to see if I can get the drawers to work better. Net of it … I think if you did a lot of handtool work, this would not be a good option. As a resting place for my powertools and a place to glue up projects, it works just fine. could it take a better vise and could you drill it for more dogs ? if you add weight to the shelf it should be more stable. I just got and am reviewing the plans for my new bench it is called the 21st century its going to be a big job for me a bit heavy but i am going to build it the same time i do norms router table since the bench will have so much drying time etc. I know it will take me a couple of weeks to finish at my new slower pace or my new faster pace depending on how you look a it. SPH,I live near Tampa too. Good luck on the drawers I couldn’t get mine square either. Otherwise I’m satisfied with it. I purchased and assembled the workbench last week. Had the same problem a lot of people seem to be having with the drawers. If this is such a common problem why don’t they do something about it? Can anyone offer some ideas what I might be doing wrong? The drawers are in but they are really hard to pull in and out. I have this same bench but I don’t have a problem with the drawers sliding. My only problem with them is that they are only half extension. Full extension would be nice. I solved the “weight” problem by screwing it to my floor. I realize this may not be an option for everyone but just the other day I was planing some board that were in the vise and there was no movement of the bench. As they said earlier, for the price you can get this on sale you really cannot go wrong. I bought one thinking the top was thicker, it was only 3/4”. Only the edge is beefed up. A friend of mine has 4 now. They are mysteriously about 1/8” lower than his Saw Stop and they work great for outfeed tables. On the last 3 he assembled, he backed the dog holes from the bottom with 2×4s. Then drilled the dog holes to 3/4”. This helped tremendously and was a very easy mod. On all 4 units, he replaced the drawer slides with ‘real’ ones, and full ext. It made a world of difference. Sill have the problem of the drawers interfering with hold downs. For the money, the benches can be very useful. Thanks for the improvement suggestions. I think I will restack the boxes down one side, reinforce and expand dog holes and add a front vise. I have the same bench, and I managed to install a front vice in a very roundabout manner. I cut the blocking drawer into two parts, then joined them with a lower support allowing clearance for the vice jaws. It looks a little funny, but works well and retains the use of the drawer (though only about 1/2 of it, since the vice mounting setup takes up the rest). I plan on drilling 3/4” holes and making or buying dogs for it, too. I used this bench for several years until I built my own. I was very satisfied with it except for the drawers which opened by themselves. Sorry – that was a moment of temporary insanity I guess. – ha. I did get the drawers figured out. They are fine now and I am very satisfied with the bench otherwise. It’s not ideal, but it’s about the only spot that would work given the leg and drawer placements. The two halves of the top drawer are joined with some plywood stretchers. - It’s not oak as advertised. It’s rubberwood. No big deal. - Drawer hardware looks cheap. All four drawers in the display model were broken. However, with mine, the drawer tolerances were perfect and they move smoothly and easily. The only problem is that the runners aren’t two-stage, so the drawers only come out halfway. Makes it hard to know what’s in the back. - Very solid overall. Vice was a little tight. A handful of non-structural screws go into composite wood pieces that strip easily. Instructions have useless pictures and very little exposition. Assembly takes about 90 minutes. - It’s two or three inches shorter than I’d like. I’m 6’1’. For a basic work table, you’d do better (not cheaper, but a larger work surface built to your specifications) doing it yourself. 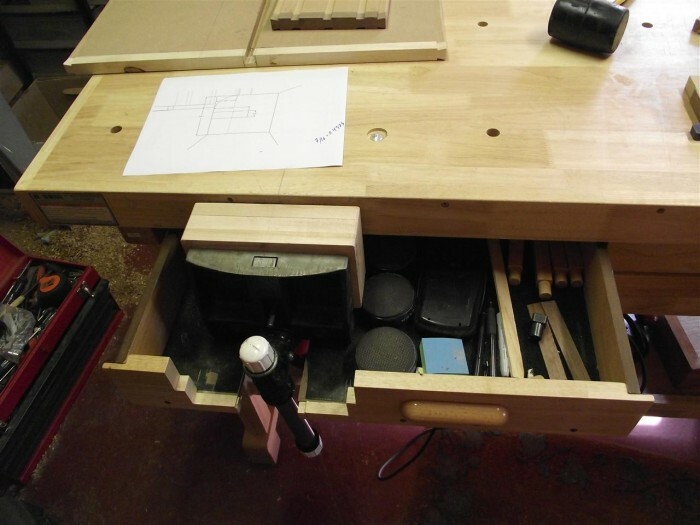 Factor in the drawers, though, the accessory hardware pieces (vice, metal and wood stops for the holes on top), and the finish, and this becomes a great deal.